Good news everyone! It’s been a mere two weeks since we released the new Opera Mini for Android, and Opera Mini is already trending among the Most Popular Apps in many countries across the global. We are so excited to welcome millions of new and returning Opera Mini fans! So, where are all of you from? 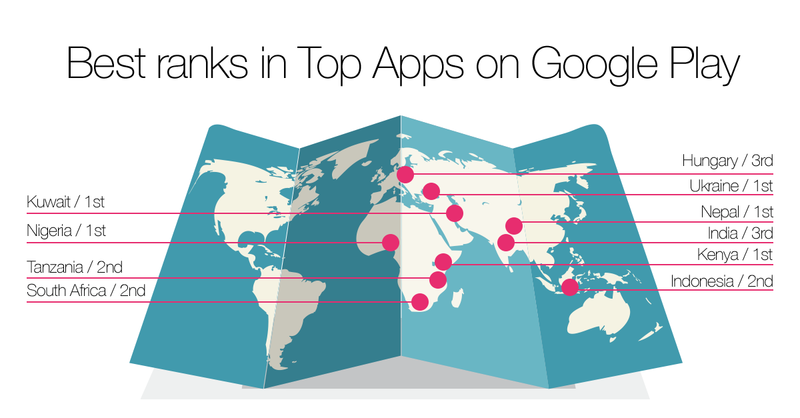 The new Opera Mini is the most popular app on Google Play in nine countries: Bangladesh, Ghana, Kenya, Kuwait, Nepal, Nigeria, Qatar, Ukraine, and Yemen . And the list goes on. Opera Mini ranks second in Belarus, Indonesia, South Africa, Sri Lanka, and Tanzania, as well as third in , Hungary, India, Pakistan and Serbia. Opera Mini even snagged 1 million new users in just one day. It’s time for a dance! Opera Mini started out as a fantasy our engineers dreamed of 10 years ago. They wanted to make the internet available on any device. They made the first rendering system that could display any web design onto any mobile phone, regardless of operating system. With the invention and adoption of the Android operating system, the dream of an entirely connected world is ever so close to reality. Since 2004, 1.8 billion people have come online and many of these new internet users benefited from the rapid expansion of mobile-network coverage and the growing availability of affordable Android phones. Opera Mini has a ton to offer these new mobile-internet participants. It is compact in size – only 2.5 MB – but rich in features. It can be installed easily on any Android device running version 2.3 and up. Our unique compression technology also speeds up page loading on slow or congested networks and gives users more value out of their data plans. Welcome to all of our new and returning users! We hope you enjoy getting online with the brand new Opera Mini for Android. Take a look here to see what the browser has to offer. Check in with us on our blog for tips on better browsing with Opera Mini. Find great tips such as how to get faster internet and how to sync your bookmarks with your computer. What are you waiting for? Download Opera Mini for Android for free. Happy browsing!